German Development studio Headup Games, has just announced the next installment of their super popular Bridge Constructor game series, and this one is going to be huge! For the past year the studio has been secretly toiling away in their underground test chambers on a fully licensed Portal-themed edition of Bridge Constructor and it looks amazing! As a big Portal fan, it has been far too long since we’ve gotten another Portal game. Portal 2 came out on the PC and consoles in 2011 and ZEN Studios’ Portal Pinball launched in 2015, the same year that a Portal level/world also arrived in LEGO Dimensions. Finally, last year, the HTC Vive had a mind-blowing, immersive VR tech demo set in the Portal universe, but to my knowledge, there was never a full game released using the theme. Other than arguably Portal Pinball, mobile gamers have never really gotten to play in official Portal universe, but that’s about to change. While perhaps not the formal Portal sequel some had hoped for, Bridge Constructor Portal looks like a really promising and complementary mashup up franchises which plays to each’s strengths and features the characters, theme and gadgets that Portal fans love so much. If the amusing and eye-catching announcement trailer is any indication, Headup Games has nailed the spirit and humor of the Portal series. 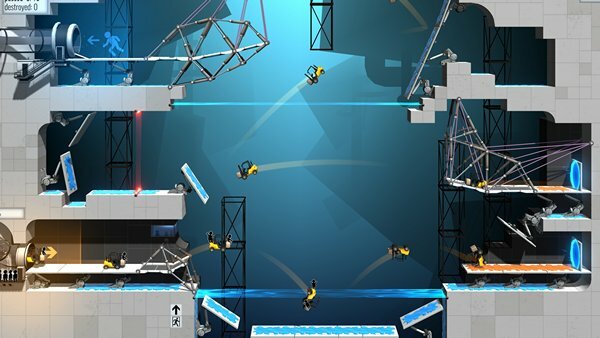 This Portal fan cannot wait to check out Bridge Constructor Portal in just a couple of weeks when it releases on Windows, MacOS, Linux as well as mobile platforms on December 20th and then early next year on consoles.